African American students leaving the OSU campus through its west gate, February 25, 1969. The racial tensions that escalated throughout the 1960s and that made an imprint on universities all across the United States were evident on the campus of Oregon State University as well. In a description that accompanied a photo collection recently accessioned by the OSU Libraries Special Collections and Archives Research Center, photographer Gwil Evans, who was a Journalism professor at OSU at the time, provided some background on event that served as a pivot point for race relations at Oregon State near the end of the 1960s. In his notes, Evans explained that, on February 25, 1969, members of the OSU Black Student Union interrupted a convocation hosted by President James Jensen at OSU’s Gill Coliseum. The convocation, which was part of a series of events marking the university’s centenary, was to feature a speech by Linus Pauling, Oregon State’s most prominent alum. The immediate cause of the interruption and subsequent protest was a demand issued by OSU’s football coach, Dee Andros, that one of his players, and African American student athlete named Fred Milton, shave his facial hair. This conflict arose in the context of a longer history of racial tensions on campus, as well as concurrent protests related to tuition hikes and the escalation of the Vietnam War. There was also an uneasiness associated with the talk itself, both with respect to Pauling’s presence on campus as well as the way in which he was introduced to the large crowd that assembled for his lecture. These issues dated back many years, stemming from a schism that had developed between Pauling and Oregon State in 1949, due to Pauling’s belief that Ralph Spitzer – a former graduate student of Pauling’s who was fired from his faculty position at Oregon State College – was let go due to his political beliefs. Pauling had known Spitzer since serving as a Visiting Lecturer at Spitzer’s undergraduate alma mater, Cornell University, in 1937. Spitzer then went on to complete his Ph.D at Caltech in 1941 under the general supervision of Pauling, and sometimes working directly for Pauling. The two shared a strong mutual respect and often closed their letters with questions asking after wives, children, and general well-being. Pauling ultimately helped Spitzer to secure research funding and a teaching position at Oregon State College by providing his pupil with a series of consistently glowing recommendations. Once they had arrived in Corvallis, Spitzer and his wife Terry became increasingly interested in American social problems as well as a multitude of issues related to the atomic bomb. This concern in matters well beyond the teaching of chemistry, coupled with Ralph and Terry’s lack of hesitation in voicing their opinions, ultimately resulted in Spitzer’s firing by OSU President August Strand in February 1949. Ralph and Terry Spitzer, April 1949. A letter that Spitzer had published in Chemical and Engineering News supporting Trofim Lysenko’s evolutionary theory of vernalization and, more broadly, Soviet science, provided a useful excuse for the OSC administration to deny renewal of his contract. Although this was, on a technical level, an acceptable action for the president to take, since Spitzer was not tenured and he was not fired for explicitly political reasons, word of the incident quickly spread across campus and the region. One of Spitzer’s immediate responses upon being informed of his impending dismissal was to write to Pauling seeking his help. He also asked for a trial before the American Chemical Society (ACS), which refused to become involved in the incident despite the fact that Pauling himself was president at the time. Nonetheless, after studying the details of the situation, Pauling wrote to President Strand and informed him that, although he did not hold the same beliefs as Spitzer, he believed his former student was certainly entitled to harbor opinions of this sort, and that OSC needed to honor them as a matter of academic freedom and respect for the principles of democracy. Speaking as an OSC alumnus, fellow chemist, educator, American, and president of the ACS, Pauling urged Strand to reconsider his decision to fire Spitzer. if by this action, Oregon State College has lost your respect and support, all I can say is that your price is too high. We’ll have to get along without your aid. Though the ice between Pauling and OSU had been broken a couple years prior, the situation remained awkward as he arrived on campus for the centenary lecture series. Of particular note, Strand’s successor as OSU President, James Jensen, elected not to introduce Pauling. Instead, Bert Christensen, who was chair of the OSU Chemistry department, was asked to fill this role. This decision was far from customary for a visitor of Pauling’s magnitude and was viewed by many as an affront. Pauling himself made note of being surprised upon learning of this breach in normal protocol. He was far more surprised when Christiansen’s introduction was abruptly interrupted by the president of the Black Student Union, the details of which we’ll explore next week. Linus Pauling’s 114th birthday, which was observed last weekend, dovetails nicely with the seventh anniversary of the creation of this blog, which we celebrate today. Milestones of this sort tend to get us thinking about our connection with Pauling here at Oregon State University and the transformative experience that he enjoyed as an undergraduate, more than ninety years ago. 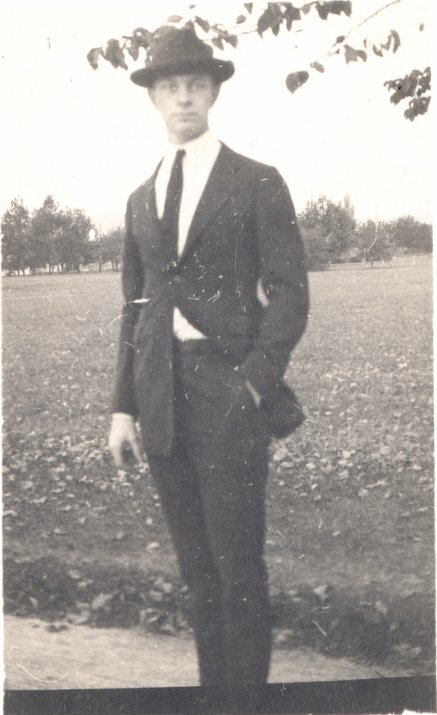 Though he left Oregon in 1922 and would never reside in his home state again, the roots of the Linus Pauling who would deeply impact so many corners of twentieth century history can be concretely traced back to his youth in the Beaver state and, importantly, to his tenure as an undergraduate at Oregon Agricultural College. During Pauling’s teenage years, questions regarding his future and the feasibility of professional training began entering his mind. As he weighed his options, Pauling had several things to consider. Of primary importance was the absence of his father, Herman, who had died in 1909, leaving the family’s financial situation teetering on the brink and erasing a vital male mentor from young Linus’s life. Though plagued with emotional insecurities, and despite being forced to hold a job from an early age to help supplement the family income, Linus still managed to discover his true passion, chemistry, as a thirteen year old high school freshman. 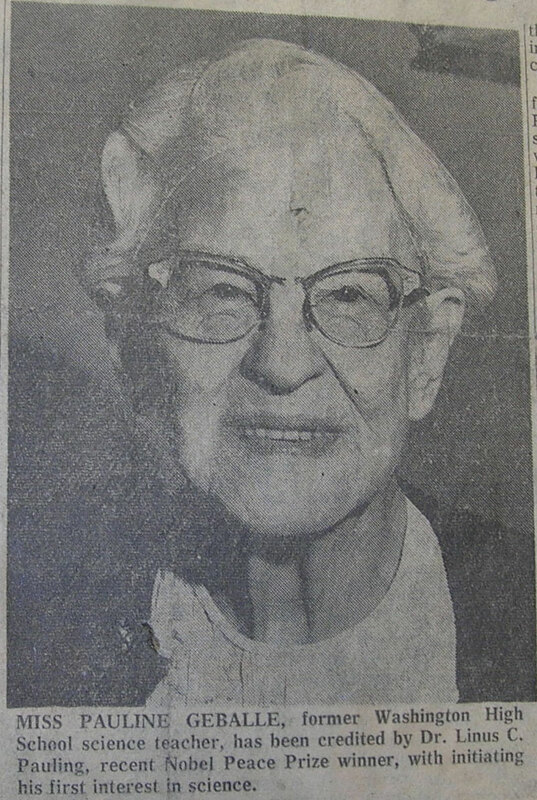 In a 1954 interview, Pauling credited Miss Pauline Geballe, a teacher at Portland’s Washington High School, for having helped him to discover his love for chemistry. Always a precocious child, Pauling began seizing every opportunity to learn more once his interest was sparked, and he took as many math and science courses as he could while in high school. Though a success at Washington, he knew that there was still much more to learn. At the time, chemistry was a booming professional field in the United States, and Pauling was aware that pursuing a degree in that area would pay off financially while hopefully satisfying his intellectual curiosity. Paul Harvey is going to OAC to study chemistry – Big manly Paul Harvey, beside whom I pale into insignificance. Why should I enjoy the same benefits he has, when I am so unprepared, so unused to the ways of man? I will not be able on account of my youth and inexperience, to do justice to the courses and the teaching placed before me. Paul Harvey, as seen in the 1919 Beaver Yearbook. It is interesting to note that finances – though a logical worry for someone in Pauling’s situation – are not what seemed to have troubled him the most. More salient is the link between experience, or “manliness,” and the benefits of an education. Pauling began college at the age of 16 and he clearly thought of his youth as an obstacle that put him at a disadvantage. OAC, however, gave Pauling more than academic knowledge; it changed the way that he thought about himself. 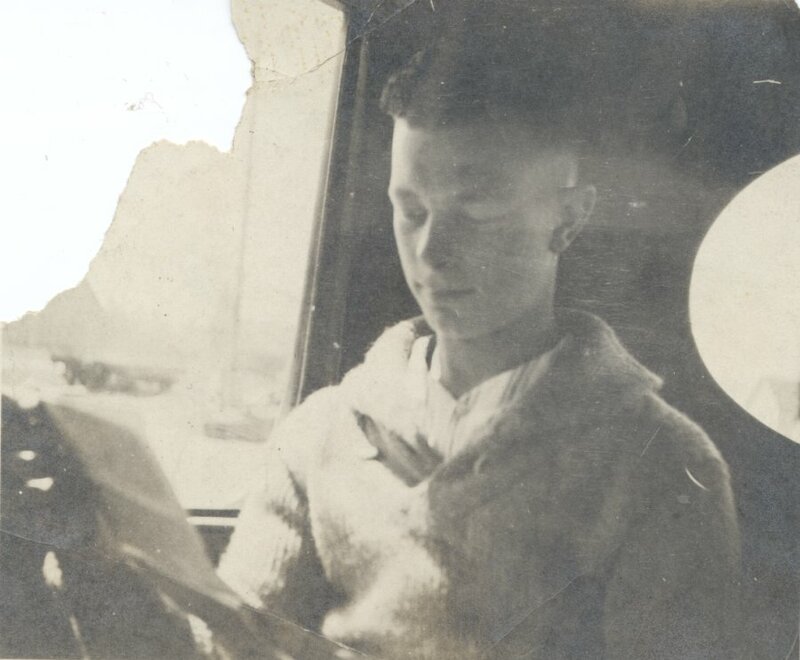 Rather than asking why he should enjoy the benefits of a higher education, Pauling left OAC brimming with confidence, in search of new opportunities as a professional and as an intellectual. Young Pauling, ca. late 1910s. To think that Pauling began his academic experience as a timid and uncertain individual may come as somewhat of a surprise; particularly so because Pauling is now remembered as an outspoken, larger-than-life figure. From the vantage point of today one might also suggest that, as he entered college, Pauling should not have felt like he lacked experience. He had, after all, just about exhausted most of the employment and educational opportunities then available to a young man of high school age. Quite early on in life, Pauling had been given the responsibility of watching the family drugstore whenever his father needed to be absent. Later on, in his free time, Pauling and his friends devised any number of new schemes to remain employed, even seriously contemplating the possibility of opening a private chemical laboratory. And in school, Pauling seized every opportunity to broaden his horizons. Looking into the records from Pauling’s undergraduate years, one might surmise that his feelings of unworthiness were overcome largely because of the OAC experience itself. In college he would develop his character and identity. And he would escape the shell of the boy who lost his father at the age of eight and who was raised by a harried mother whom, in his later estimation, didn’t understand him very well. 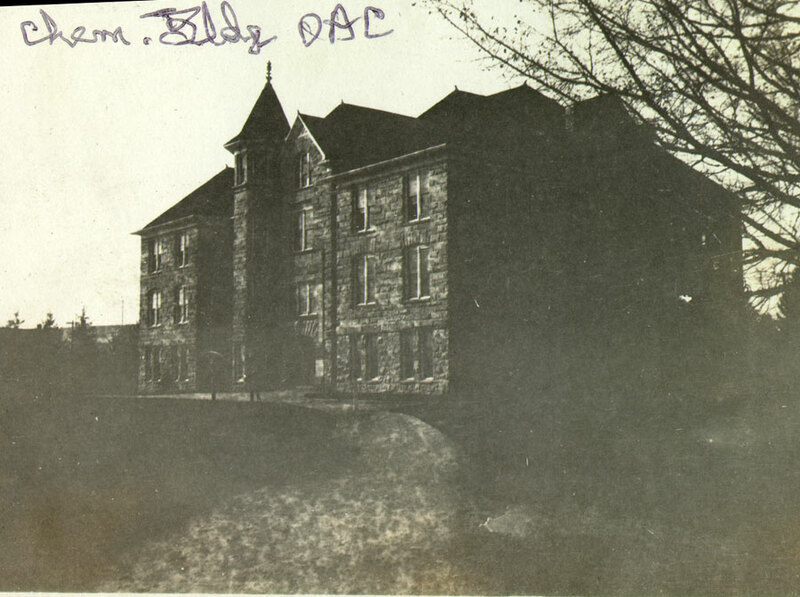 By the time that he had graduated, Pauling’s overwhelming sense of his academic experience was that of dissatisfaction with the limitations from which OAC suffered at the time. Students were required to learn only the basics of chemical engineering and most of his professors lacked professional experience in the chemical industry. Most of the department’s professors did not have a doctorate, and of those who claimed a post-graduate education, at least one was lying. Known then as the “Chem Shack,” OSU’s refurbished Furman Hall now houses the College of Education. 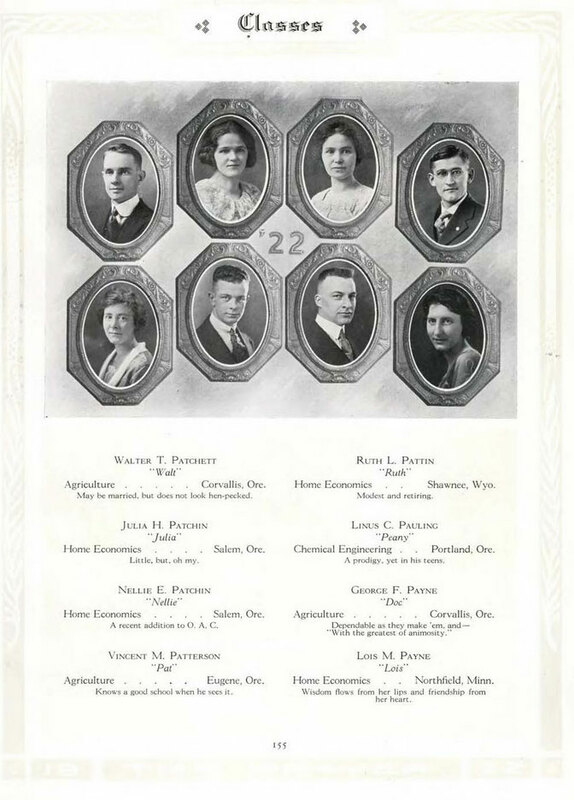 There were faculty members at OAC, however, who were aware that professions in the sciences were changing and that both a research infrastructure and a chemical industry based in the United States were on the ascendance. OAC professors like Floyd Rowland did their best to expose their students to the latest findings and research methodologies in the field. Indeed, Rowland, the head of the chemical engineering program, so impacted his students that nine out of the twelve in Pauling’s graduating class went on to pursue post-graduate education – at that time, a near unimaginable success. So while Pauling’s hunger for an academic challenge was not quenched as an undergraduate, he surely began to discover his true potential at OAC, and he had at least a few people on campus helping him down that path. 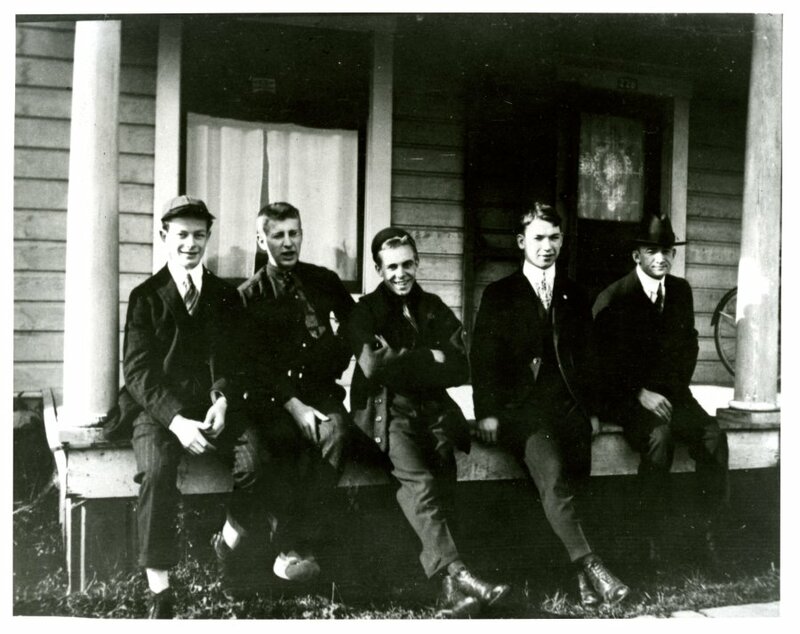 Pauling with a few of his Gamma Tau Beta fraternity brothers. Pauling, at left, wears his “rook lid,” required apparel for all OAC freshman boys at that time. Ca. 1917. 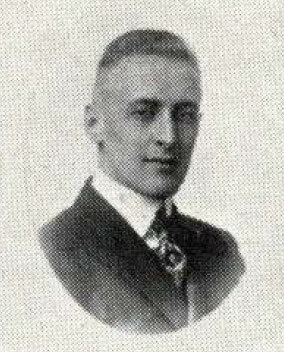 Concerning the social side of Pauling’s undergraduate experience, it is known from his letters and reflections in later years that his involvement in the fraternity system was very important to the development of his personality. Pauling credited the OAC Chapter of Delta Upsilon for bringing him out of the isolation from his peers that he had felt as a child and had initially experienced upon moving to Corvallis. His involvement in the Greek system began when he was invited to join Gama Tau Beta. Pauling later suggested that this likely came about because the house needed to bolster its grade point average and knew that Pauling would provide a big boost. Whatever the reason for Pauling’s invitation, he joined and he greatly benefited from the company of new found brothers. up until the time that I became a member of Gamma Tau Beta there was no one who strove to teach me how to get along with my fellow human beings. So while Pauling was discovering his academic and professional potential through his classroom experience at OAC, his shyness was also being overcome by the social mentorship that he received from his fraternity brothers. When he left Corvallis, Pauling was well on his way to becoming the confident individual that many came to know over the ensuing decades. A very early – perhaps the earliest – photo of Ava Helen Miller and Linus Pauling together, 1922. 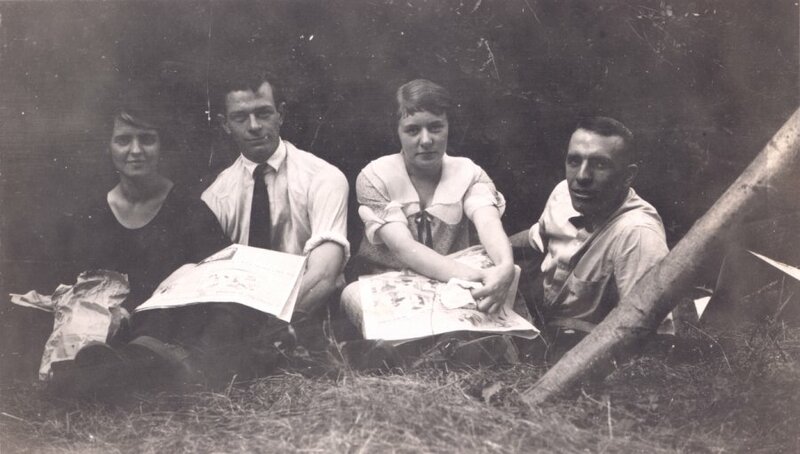 OAC provided a wealth of opportunities for Pauling to cultivate his talents and discover his potential, but probably the most important outcome of his undergraduate experience was the relationship that he developed with Ava Helen Miller. As we’ve seen, Pauling’s academic prowess was noted by students and faculty alike, so much so that, during his junior year, Pauling was hired as an instructor and assigned to teach freshman-level chemistry. He was eighteen years old at the time. On January 6, 1922, Linus entered a classroom nervous, but basically ready, to teach a class of Home Economics majors. The era being what it was, this class consisted entirely of female students. Feeling a need to establish his authority from early on, Pauling decided to ask a tough question. He ran his finger down the registration sheet, looking for someone to call on in response to the inquiry, “what do you know about ammonium hydroxide…Miss Miller?” Ava Helen responded with a quite satisfactory answer – the class had studied this compound during the previous term – and thus began a relationship that steadily developed into a romance. In the months that followed, the connection between the two quickly developed and, before long, the young couple was engaged. Posing together on graduation day, 1922. Linus’s early relationship with Ava is of notable importance because it bridges two periods in his career: the end of the OAC chapter and the beginning of his long run at Caltech. 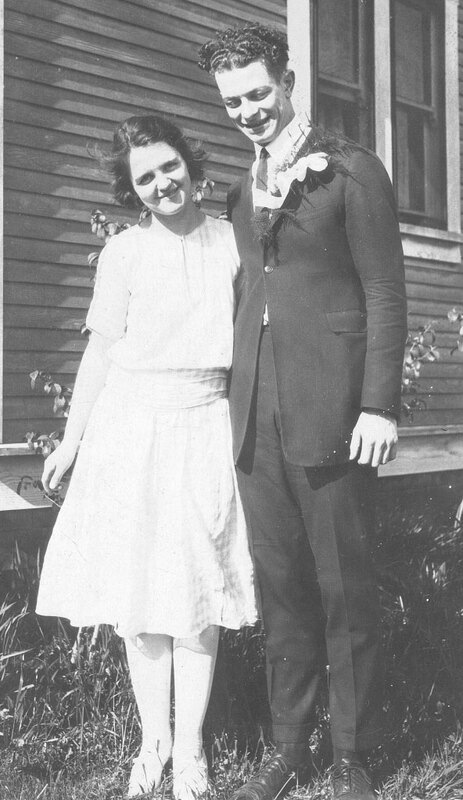 Linus graduated from OAC in June 1922 and moved on to Pasadena while Ava Helen stayed in Corvallis for more schooling, the couple’s desire to wed temporarily squelched by both sets of parents. Separated for one year, the two wrote to each other nearly every day, and in these letters Linus expressed his true self to Ava Helen in a way he had not done (and never would do) with anybody else. Later on, in marriage, the two would inspire each other to take their work even further. Ava Helen’s interest in world affairs would propel Linus’s awareness of the need for peace activism, and Linus’s dedication would inspire Ava Helen to become a leader in countless social justice organizations. As a friend of the duo wrote in 1960 “the Paulings don’t stand in each other’s shadow, they walk in each other’s light.” For us, as we reflect on the milestones of today, it is gratifying to know that this hugely important couple owed their introduction to the little land grant school in Oregon’s Willamette Valley – a fertile space then, as now, for the transformation of bright young minds.